I really liked my chocolate chip banana mookie recipe. Mookies, in case you are not familiar with my previous post, are what I dubbed this cross between a cookie and a muffin. These are fluffy, slightly cakey cookies, with just a phenomenal hearty texture. When I started to think about what other kinds of "mookies" I could make, I must have had apples on the brain. Thus, apple pie mookies were born. With oats, hearty chunks of apples, wonderful warm apple pie spices, and butterscotch chips, these just scream cozy fall day. And considering it is 95 degrees out, I could very much use a mental escape to a more pleasant season. The apples are softened but juicy, and a tart contrast against the sweet butterscotch chips. Slightly chewy oats give way to a fine, cakey crumb. Seriously, I don't know how many ways to describe the awesomeness except to say you just have to try them. Let me just say, my house smells beyond amazing right now. If I could eat the air I would. But I guess I will settle for eating these cookies instead. And at just around 100 calories each, I can afford to have a couple! These are absolutely a must try. Really, seriously, in the stratosphere tasty. Whisk together flour, almond meal, salt, baking soda, cinnamon, nutmeg, allspice, and ginger in a small bowl and set aside. Place butter, and sugars into a mixing bowl and beat on medium speed until they are well combined. Depending on how soft the butter is, it may take several minutes for the mix to come together. Reduce speed to low. Add egg, applesauce, and vanilla and mix until combined. Beat for 1 minute on medium until well combined. Add flour and spice mix and mix on medium until well combined and fluffier. 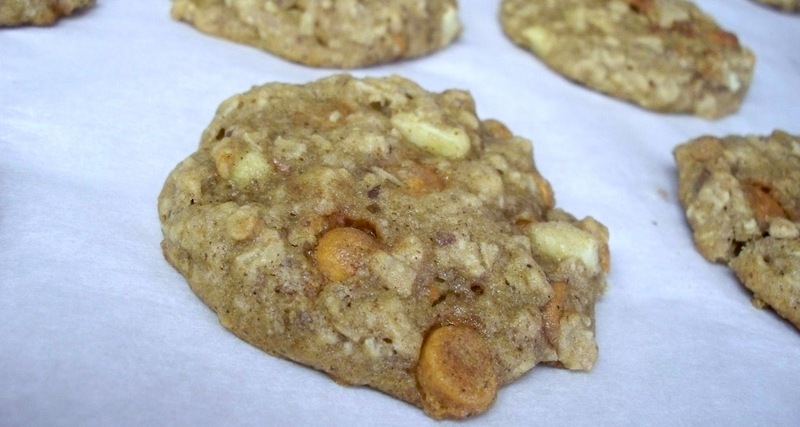 Mix in oats, apple pieces and butterscotch chips with mixer or by hand until well incorporated. Don't fear, this dough is very moist. Using a 1 1/2-inch ice cream scoop or 2 Tbs cookie scoop, drop dough onto baking sheets spacing about 2 inches apart. Using a fork, flatten the dough into a disk shape, they do not spread much. Bake cookies until they just start to turn golden brown and just set, about 12 to 13 minutes. The centers will be fairly firm, like a cooked muffin, when done. oh yum!!!!! Another great cookie recipe. I think I want to bake more cookies this weekend. Thanks for sharing on my link party! The only problem with making cookies is that it means that need to be eaten...which I have no problem with, but my waistline does :) Thanks for stopping by! Thanks for joining us this week at Foodie Friends Friday. Please be sure to link the recipe to our site and return on Sunday to vote. Your Apple Pie Mookies look delicious, we will really enjoy them. Hope you are having a great weekend and thank you so much for sharing with Full Plate Thursday. Thank you for stopping by and for hosting! I want to eat that right now pleeeeeeeease. They look SO GOOD! Thanks for linking up and happy Monday!! Thank you so much for the feature, I am honored! Thanks for hosting as well! Oh wow, I love cake cookies so I can only imagine how much I would love these 'mookies'!!! Pinning! Thanks so much for pinning and hosting! Awwww thanks so much for the feature, that is so fantastic! love your parties, thanks for hosting!